Im still pretty new to all of this but I built a simple frame while I was saving up to buy a carbon fiber or G10 frame and in the end I love it so much I don't have any need to upgrade, at least until I get good enough for some detail to matter to me. So with no metal fasteners (only zip ties) and only two basic tools to build it (hack saw and drill) I thought this may be interesting enough to share and maybe get some ideas to improve it or inspire someone else with some of the unique(ish) design choices. 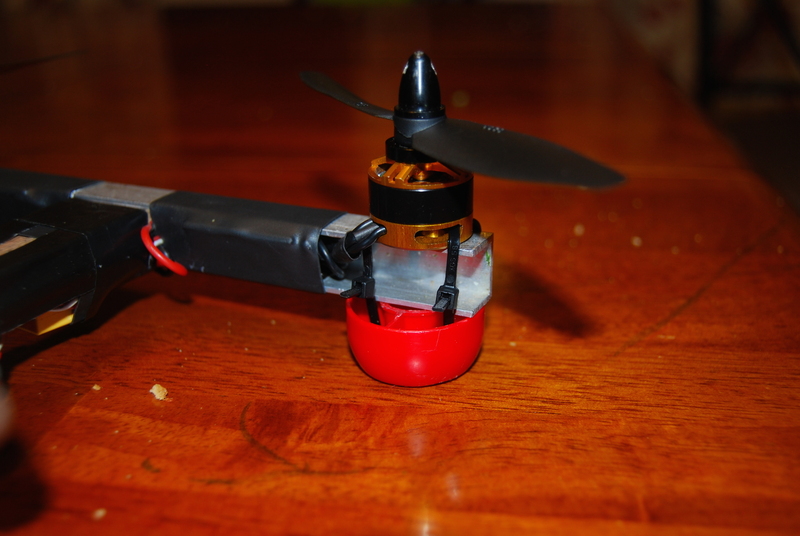 I recognize that there are probably some bad choices as well but I was trying to keep it simple to build, cheap, light, and able to handle a crash. So far so good it seems to fly extremely well. 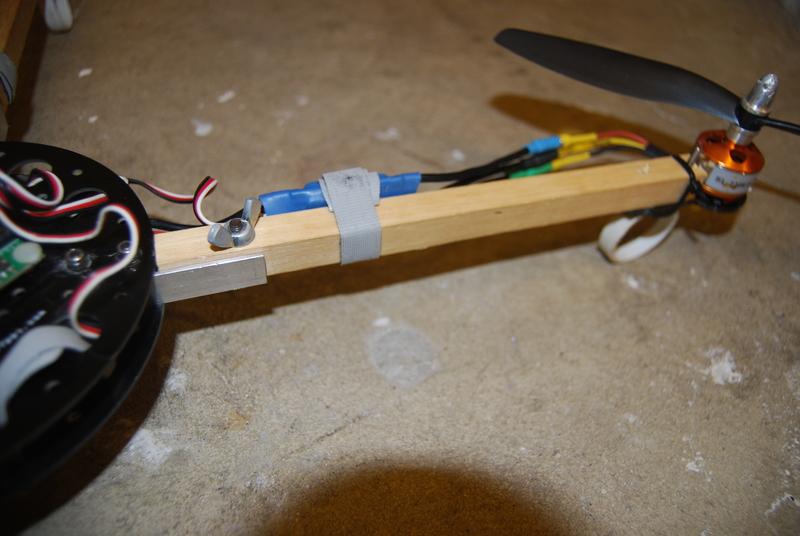 Some of the more interesting features are the landing gear made from the caps off of baby pouches and the basic frame is made from two pieces of 1/2" wood glued together and pressure fit into two pieces of aluminum u-channel. I also have the esc's shrink wrapped directly into the u-channel with tape covering the aluminum and I used copper strips on the bottom of the wooden center piece for makeshift power distribution. Lastly the motors are zip tied to the landing gear with a hole drilled in the top of the aluminum to allow the bearing and shaft to not sit on the channel. Doesn't take much to get a frame in the air! I personally prefer wood over aluminum since it's more of a "fuse" against breaking expensive bits like motors (though that didn't seem to work out too well for me!) and it's sometimes even lighter than some aluminum options! Got any video of it to share? 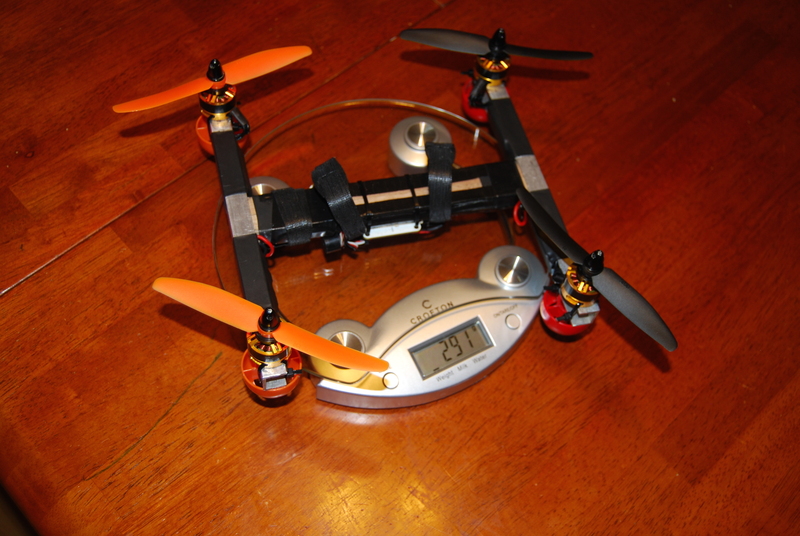 Nice looking quad and welcome to the forums, cloverstone. It looks like you're running 5030 props on it if I'm not mistaken. No need to replace them right now if you're happy with the way its performing, but when you do go for the HQ 6030's. The difference between the ones you have now and the 6030's is amazing, and those DYS 1806 motors wont have a problem spinning them at all. 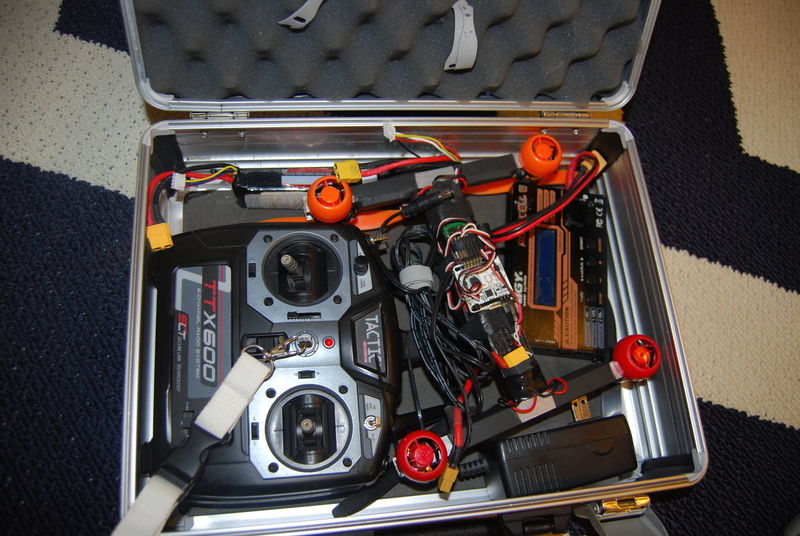 Do you have any pictures of the wiring/power distribution solution on the bottom of the quad? Thanks, I have been stalking the forum for a few months now so I saw your troubles. I had built this around that same time (maybe a week or so sooner) and was looking for ideas in yours. The would is definitely a little lighter than even the u-channel aluminum even with it not being a full tube. My scale isn't the most precise but it seems that the wood is about 25% lighter for a given length. The choice for aluminum was actually a very deliberate one in that I don't fasten it to the wood it is just pressed in so on a hard crash it just tips to one side or pops out completely and I can just press it back together. I have been toying with the idea of of using a zip tie though the wood horizontally and through two holes in the front of the aluminum if it starts getting too loose, as it is most landings will cause it to tilt a little if there is any horizontal motion when landing. I have had some pretty bad crashes so far, many at max speed (at least the max I can achieve) or from 40-50' up and the most I have broken are a few zip ties and/or props so that seems to be working well for my "fuze". Thats also why the motors are only mounted with zip ties, those are the ones that break in a bad crash. I originally used the aluminum to make removable arm mounts for my 450 size electrohub quad and noticed that vibrations to the FC were greatly reduced. This brings me to the second reason I used them and that is that I believe the mixture of the two materials reduces vibrations reaching the FC. I am not entirely sure this is right since I have only the one observation and no further testing, but I do know that waves do not propagate well across material boundaries when those materials have significantly different properties. I would be very curious if anyone knows if this is a significant factor with these frequencies and materials. A final and lesser reason is I put the esc's and wires inside the aluminum to streamline the look and protect them better. As for video I have been meaning to do that since I built it but have not yet, maybe this will be a good motivation to do so, will update when I get one. I will try to get one from the Mobius too, I haven't recorded any there but with the limited FPV I have tried on it the Mobius has been pleasantly jello free so far especially compared to the larger quad. I know its not a great reason to fly inferior stuff but it sure makes bringing everything on my lunch break to fly easier. I didn't take any pictures before covering the ends with 1" shrink wrap but maybe this picture and a little description can give a better idea. I cut two strips of copper 6" long by 1 cm (yeah I know I mixed units but it made it easier) and taped them down with about 1cm exposed at each end and then soldered the front escs on and covered the end with shrink tube and then the back end seen in the pic I did similar only I added an xt60 connector flat and a few pigtails, one for the naze to monitor and one for FPV equipment. You can see the channel in the tape between the two copper strips in the pic too. Keeping that flat allowed me to zip tie the naze on with just a piece of rubber between it and the frame to prevent the tape from ripping and add a little more isolation. 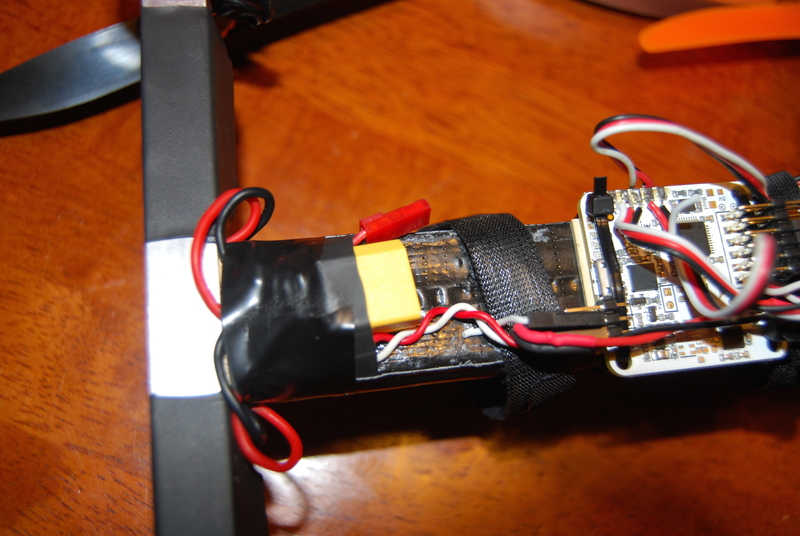 Also their is tape covering the esc servo wires witch run along the side of the wood, and I have yet to find a place I am happy mounting the buzzer, and getting a transmitter that would allow for a receiver that did't require 8 wires would help clean a lot of that up too. Love it. I wanted to do zip ties on my wood frame for the motors but with no cross mount wasn't sure how to approach it - never thought of doing it the way you did! The mounts I came up with were a bit heavy but seemed to do a good job of holding tight but still letting the motors come loose in a crash. I like the wood in the aluminum as a fuze as well. If you've been following my build then you probably know I was considering using nylon screws as a fuze between my "hub" and arms. These minis definitely seem to have fewer jello issues than larger quads. I suspect the reason is the frequency of the vibrations...my theory is that the higher frequency vibrations from these higher Kv motors just don't cause as much jello as the lower frequency vibrations from slower motors. I was shocked when I put my mobius right on the warp and my wood frame and had practically no jello while on my knuckle quad even mounted with some padding or some other isolation methods I still get jello. jhitesma, I concur with your theory on vibe. The high freq vibrations don't seem to shake the electronics as much as the low freq vibe you get off large, heavy motors. OMG Cloverstone, is that a white Naze version 1?? I agree that the higher frequencies are handled better as well, especially for video. I just noticed a big difference on the larger one when doing auto-level with a KK2.1 before and after the mod and thought wave propagation across material boundaries might have played a role. I believe its a revision 5, I just ordered it about two weeks ago from http://www.multirotorsuperstore.com/ so I assume its not an old version, but I too was surprised by the color. Timecop did a black run a month or so ago so it wouldn't surprise me. Cool, a white Naze 5. Yeah, the Naze32 boards that MRSS has right now are white rev 5s. I almost want to order one just so I can have a white board on my quad... I'm a sucker for white items. jhitesma - Mounting the motors that way was the last thing I did, I had them on cross mounts from my bigger motors while I was trying to figure out a better way. I spent weeks trying to come up with some special mount and to be honest was watching your thread waiting for you to come up with something I could use too. If I recall, you even asked for Ideas, and I held off to avoid being a fool since my idea was completely untested. I made probably half a dozen complex mounts myself before I decided to just try what seemed too easy to work. After flying it that way for a few weeks now though I can definitely say it works well enough for me. Here is a close up since I realized this part may not be obvious in the other pics. Also for the sake of completeness, I checked my naze32 and it is indeed a rev 5.